More great music this May, and the weather outside is perfect for helping Ladybug Gardeners maintain the grounds. After the concert, head over to Fairmount Elementary for FiestaVal. Summer classes will mean more foot traffic at the center, so please keep an eye out for suspicious activity. This month meet Joe Scott, the facility coordinator, and Richard Hildreth, the new volunteer music coordinator, in this newsletter. And you might as well re-introduce yourself to the sandbox saga. Or introduce us to your friends by using the link at the bottom of this newsletter to forward it. The Itsy Bitsy Spider is a great big hit in the hands of former Sippy Cup Alison Faith Levy, who brings her keyboard, guitar and accordian to the May 14 Saturday morning concert for kids in the auditorium. The Sippy Cups are a wildly successful Bay Area “psychedelic kid rock band” with a national following that Levy joined early on in 2004. She left in 2009 to spend more time with her family and work with her “adult” band, McCabe and Mrs. Miller. On the heels of that band’s success (and its break from touring) came a renewed interest in children’s music. A manager at Phoenix Bookstore on 24th Street, Levy started playing songs at Wednesday morning story time. The gig has become crawling-room-only in only two months, and Levy hopes to find a bigger space. Upper Noe, perhaps? 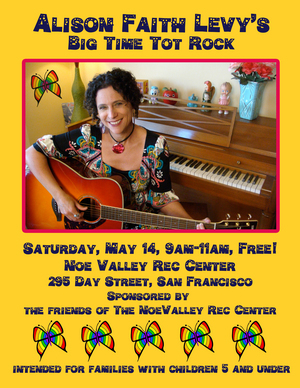 Sponsored by the Friends of Noe Valley Recreation Center, Levy’s concert of amplified acoustic music runs from 9 to 11 a.m. Tot toys will be out for the under 5s. If ever there were a poster child for the Department of Recreation and Parks, it would be Joe Scott, the facility coordinator at Upper Noe Recreation Center. Scott, 42, started in the department as a youth worker and has worked his way up over the last 18 years. “The biggest change has been the website and the programming,” he says. Last August the department underwent a significant reorganization, moving away from site-based programming to a city-wide model. Previously, directors at each site not only planned but also led all classes, from softball leagues to pottery. Site-based coordinators like Scott still create the program schedule, but classes are now taught by part-time “recreation leaders.” Each each program—sports, arts or aquatics, for example—is managed by one person who implements that program across the city. Scott is upper Noe’s site-based facility coordinator. He is proud of the wide array of classes and leagues at Upper Noe, but there is a high turnover of teachers, he says. Scott is working hard to develop relationships with those that teach popular classes, especially the three who teach tots. “You don’t want to keep changing teachers, because the kids get used to one teacher,” said Scott, the father of a 12-year-old girl and an eight-year-old boy. He gets to know the teachers and works to bring in more classes to give them more hours. He is also hoping to see more use of the fields and grounds. The San Francisco native met his wife in the third grade at John Muir Elementary School, and they later dated in high school. She, too, works for the department. The family bicycles together, walk the dog and make arts and crafts at home, he says. Call Joe Scott at 970-8061 to join the Upper Noe Recreation Council, the citizen body that helps decide programming at the center. Terms last two years, and the council will meet once a quarter once it is complete. Look for a lively lineup at future second-Saturday concerts, thanks to Richard Hildreth, the new volunteer music programmer. “I’m looking forward to doing this,” says Hildreth, who took over music programming for the Noe Valley Farmers’ Market three years ago. He now has a good relationship with two dozen musicians and acts, and many of them will be appropriate for Upper Noe, he says. Hildreth has specific ideas about what kind of music is appropriate for tots. Think The Beatles, not Barney. On the second Saturday of each month, the Friends of Noe Valley Recreation Center hosts free musical performances in the auditorium for families with children under 5. The program, paid for by donations, was created by volunteer Kate Haug last year in the hopes that parents would come and volunteer with the Ladybug Gardeners that work at the Recreation those Saturday mornings. According to Hildreth, Upper Noe’s sound system is excellent, but don’t expect the volume up to high for the kids’ concerts. The music will still be acoustic with limited amplification, if any. Hildreth says he is happy his work straddles the neighborhood. “I’m hoping to create more of a bridge between the upper and lower Noes as it were,” he says. Wonder what all the rumpus was in the gym April 9? 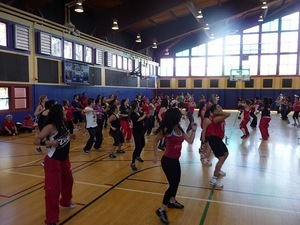 It was a Zumba-thon led by the center’s Zumba teacher, Rosie Leon DeGauntier, among other teachers. More than 100 people paid $10 to $15 to dance their way to fitness while raising $1,650 for the American Heart Association’s Go Red por tu Corazón movement, which seeks to promote heart disease awareness among women in the Latino community, says DeGauntier. They might well be excited now—Zumba is a trademarked Latin-inspired fitness program that is both fun and good exercise, says DeGauntier. Friends of Noe Valley Recreation Center has been working with Kristin Bowman, Teresa O’Brien and Shannon Miller, Upper Noe’s regular gardener, to green the Sanchez side of the facility. The Sanchez Street side was not planted during the 2008 renovation, and that side of the building was left bare. Friends has been trying to get the area planted since the center opened. On April 9, Joan Lionberger, the lead Ladybug Gardener, and some families from Fairmount Elementary, planted the area closest to the gym. Fairmount Elementary is this year’s participant in the LadyBug Civic Challenge, a Friends of NVRC program designed to support local public schools by exchanging volunteer hours for a donation to the PTA. In Novemeber, the Friends will finish the greening project by planting sustainable and drought tolerant plants. Max and Joe Thomas are pictured. Check out a local Spanish Immersion school and meet some parents at Fairmount Elementary’s 10th Annual FiestaVal Saturday, May 14, from noon to 4:30 p.m. Celebrated food writer, chef and cookbook author Tara Duggan joins forces with professional pastry chef Jenna Meyer to create a Latin American feast. Butterfly tent? Got it. Pony rides? Yep. YMCA Bike Rodeo? That, too. Carnival games and jumpy houses? Of course! The day closes with a capoeira dance performance. Plans to install a sandbox cover to foil kitties looking for a litter box hit a snag. Friends had expected to buy a spa cover, but it standard sizes did not fit. Consequently, a custom cover must be made. We will keep you updated on any progress. Around 20 neighbors showed up at the April 21 meeting of the Upper Noe Neighbors to hear AT&T’s plan to install utility boxes in the neighborhood, said president Vicki Rosen. Currently Comcast is the only provider to offer a bundle of phone, internet and TV in San Francisco. AT&T’s U-Verse would change that. But U-Verse needs 726 utility boxes across the city, including a handful in Upper Noe Valley. (The representative did not have a map of locations for the entire neighborhood.) The boxes are light grey and four feet tall by four feet wide by 2 ½ feet deep. Opinions on the installation were mixed, Rosen said. The biggest fear seemed to be that the boxes would be magnets for graffiti, though AT&T promised to quickly remove any markings. In the past month, park users might have noticed signs posted on Upper Noe Recreation Center’s bathroom doors alerting the community to be observant. These signs were posted as a precautionary measure to encourage parents and caregivers to be watchful of their children. No incident happened on our sites. The signs were prompted by an alleged indecent exposure incident at a branch library located outside of Noe Valley months ago, according to the department. Though the incident did not take place on a Rec and Park site, the management asked site staff to post signs warning parents to be vigilant. The signs have since come down, but precautionary measures remain in place. Staff will sweep the site every half hour and have coordinated with Ingleside police officers to drive by the facility during operating hours. Please help out: Summer camp and classes will mean a lot of activity on facility grounds, so if you see any suspicious activity on the grounds of the park or in the recreation center, call the SFPD at 911 or 553-0123 and notify staff immediately. Staff members are in the front office across from the gym. Thanks! Registration for summer classes begins May 21. This summer, Upper Noe will offer a variety of classes, activities and events for everyone, including dance classes for seniors, yoga for adults and art and science classes for kids. Please contact Molly (molly@noevalleyreccenter.com) or Kate (kate@noevalleyreccenter.com). Friends of Noe Valley Recreation Center is organizing an elementary school fair that will feature public, private and parochial schools from Noe Valley, Glen Park, Bernal, Outer Mission and Potrero Hill. We need people contact the elementary schools and local preschools and to help on the day of the event, Sunday, September 25, in the morning. Parents for Public Schools will also be participating. Sponsored by the FoNVRC. Contact Kate. Join Joan Lionberger (add link) and the Ladybug Gardeners to weed, plant and prune the grounds of the Recreation Center. This month’s focus will be on weeds along Day Street, Sanchez Street and the dog park. Please bring water, hand tools, gloves and brooms. There will be projects for children working with their parents.